Ferris Wheel or Observation Wheel? I recently learned that a Ferris wheel is not a Ferris wheel if it is a giant observation wheel. Yes, you heard me right a Giant Observation Wheel. Personally, I think its just a term to help distinguish and market the 4 Giant Observation Wheels worldwide that claim this title. These four wheels are located in Australia, Singapore, England and The United States of America. Can you guess the name of these wheels? So what is the difference you may ask between a Ferris Wheel and a Giant Observation Wheel? The below table sets out what separates a mere Ferris Wheel from a Giant Observation Wheel. So who invented the Ferris Wheel you might ask? The original Ferris wheel was designed and constructed by the company Ferris. This wheel debuted for the 1893 World’s Columbian Exposition in Chicago. The term Ferris wheel is used for all such structures. The Ferris Wheel is the most common type of amusement at fairs, carnivals and shows worldwide. 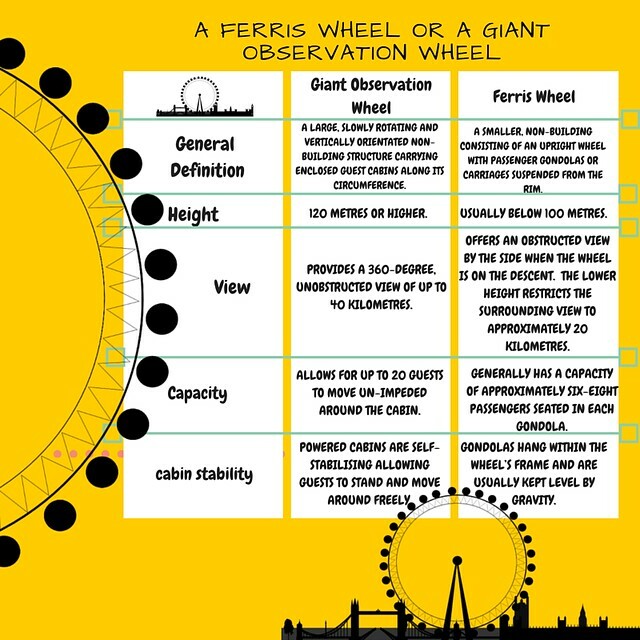 Ferris Wheel or Observation Wheel explained! Now getting back to these four Giant Observation Wheels, The four are The Melbourne Star, The Singapore Flyer, The London Eye and The Las Vegas High Flyer. I have asked 3 other outstanding bloggers who have taken a trip on the Flyer, The Eye and the High Roller to tell us about their experience. I will complete the foursome with our experience on the Melbourne Star. 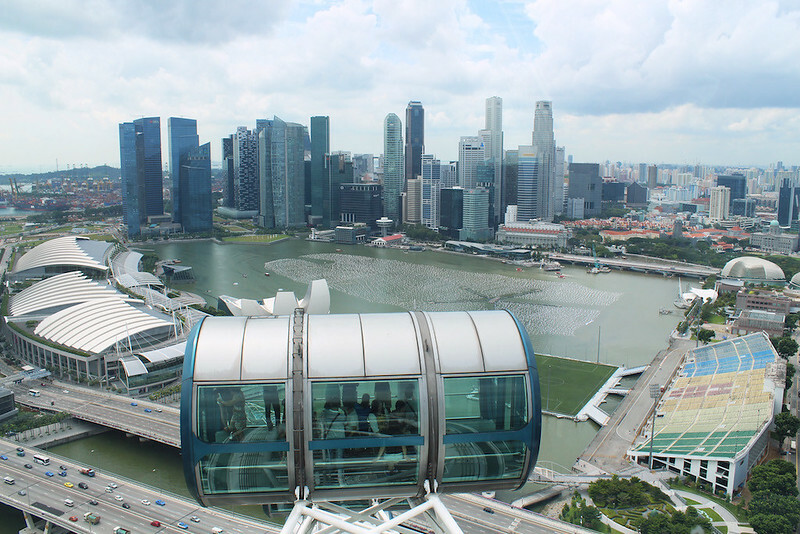 The Singapore Flyer was the world’s tallest observation wheel until the High Roller opened in Las Vegas on 31st March 2014. Regardless of its superlative status, the Singapore Flyer still stands at 165m tall, the height of a 42-storey building (or 31 male giraffes stacked on top of one another!) and offers fabulous views across Singapore and the surrounding islands. The wheel turns at a leisurely 0.21m per second, giving you plenty of opportunities to take in the unparalleled 360° views over the city and across to the surrounding islands during the 30-minute journey. 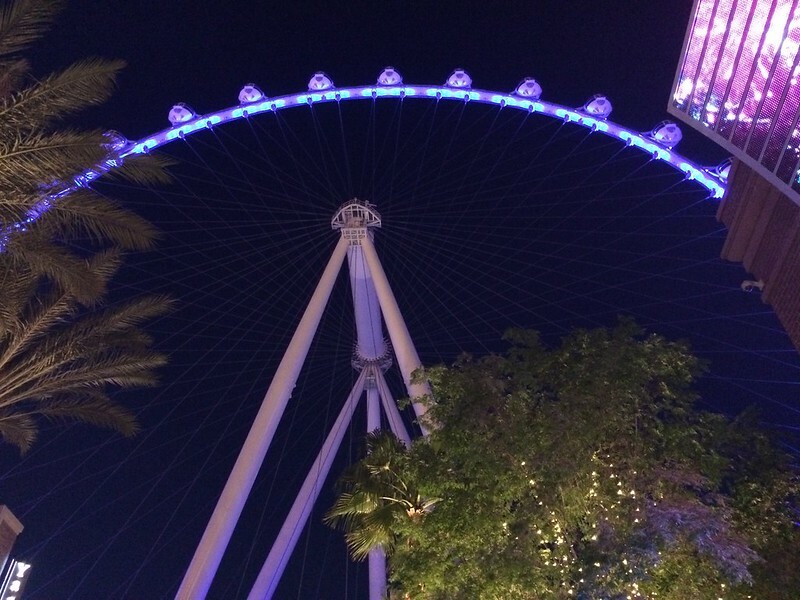 Standing at 550 feet high, Las Vegas’s High Roller is the world’s largest observation wheel. It towers over the Strip at the LINQ Hotel, making a single revolution every half hour. It is slow enough for riders to hop into one of 28 fully-enclosed pod cabins as each one passes by the loading area. 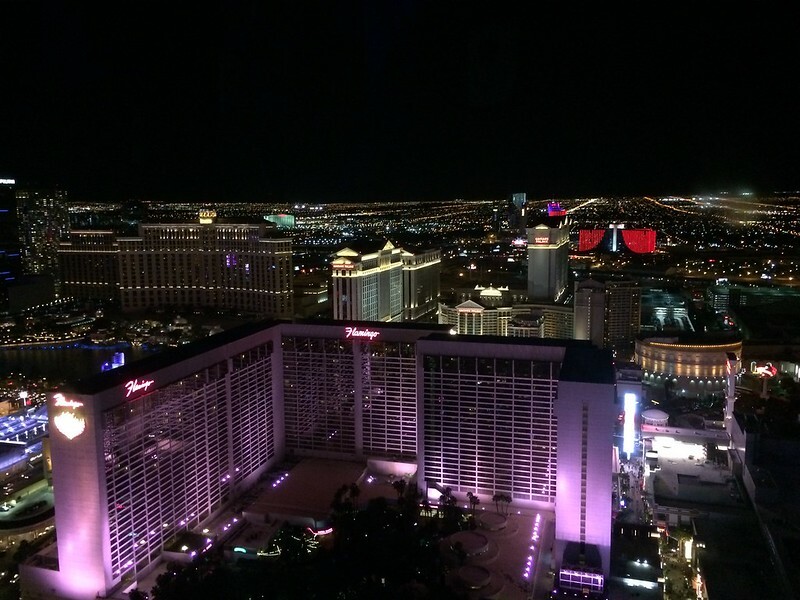 The bright lights visible along the Strip are breathtaking at night. This is definitely why the attraction charges increased fees after sunset. The good news for family travellers, however, is that kids 12 and under ride free at any hour. 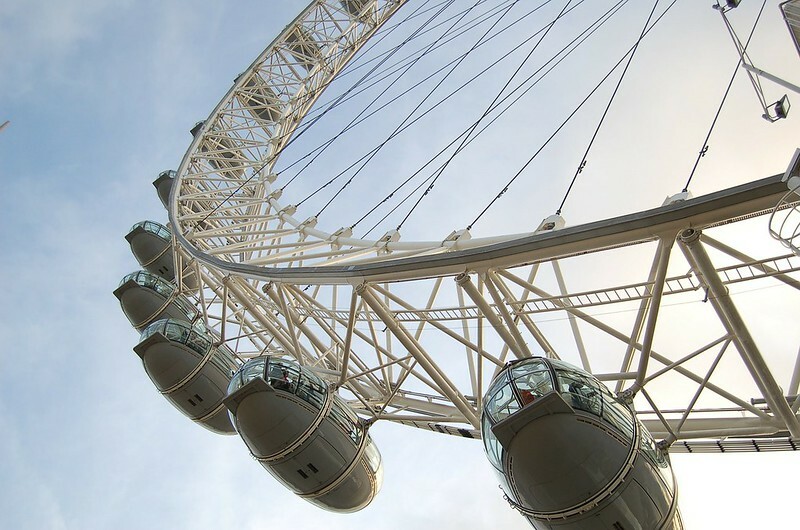 The London Eye is 443 feet (135 m) tall and the wheel has a diameter of 394 feet (120 m). When the Eye was completed in 1999 it was the world’s tallest Ferris wheel. The Eye is Europe’s largest Ferris wheel. The Eye for a long time had the distinction of offering the highest public viewing point in London. In 2013 all that changed when the Shard building opened the viewing platform on the 72nd floor. The viewing platform stands at 804 feet. 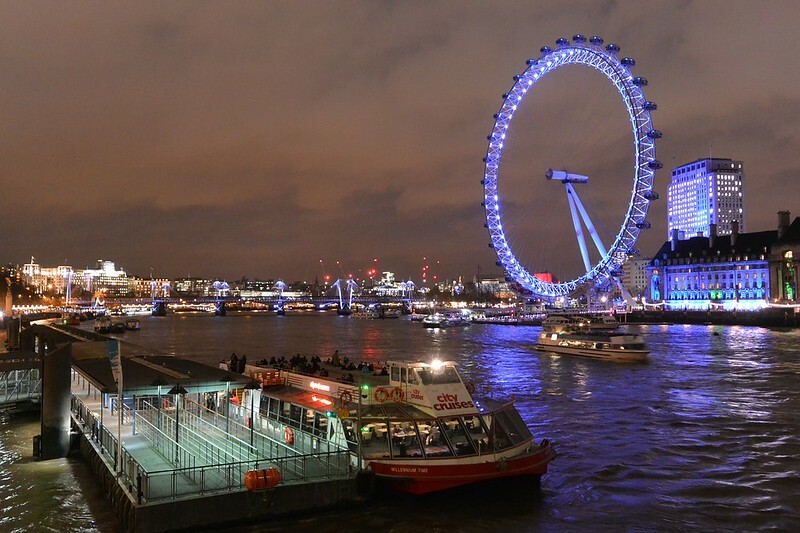 The London Eye is one of the best ways to see London and to appreciate where everything is. The Eyes is situated on the South Bank it is in a lovely location and well worth a trip. If you haven’t booked tickets in advance (which I would recommend) go early. My 5 year old enjoyed her time on the London Eye. In all honesty, I think she was too young to understand the perspective it gives you. She was more interested in the touchscreen monitors which tell you about what London landmark you can see. Children who are older will appreciate the sights more. There are also 241 tickets available for example from The Days Out Guide and with national rail tickets. The discount tickets can reduce the price from £21.50 each to two for £21.50. Definitely worth doing. Stop by a see what Karen’s has been up to at Mini Travellers. 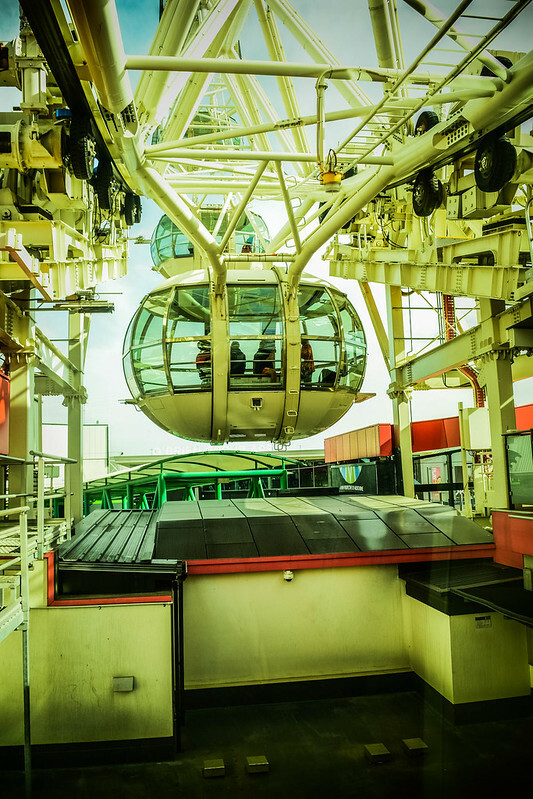 At 135 meters, the Coca-Cola London Eye is one of the world’s tallest observation wheels, offering breathtaking views of London and its famous landmarks. Your ticket includes new interactive guides powered by Samsung Galaxy Tab and an entry to the London Eye 4D Experience, an inspiring journey of discovery that brings London to life through multi-sensory special effects. The Giant Melbourne Star Observation Wheel is 120 metres high. The wheel has 7 spokes which represent the seven stars on the Australian flag.The Star comprises of more than 7.5 kilometres of steel tubing, weighing over 1736 tonnes. 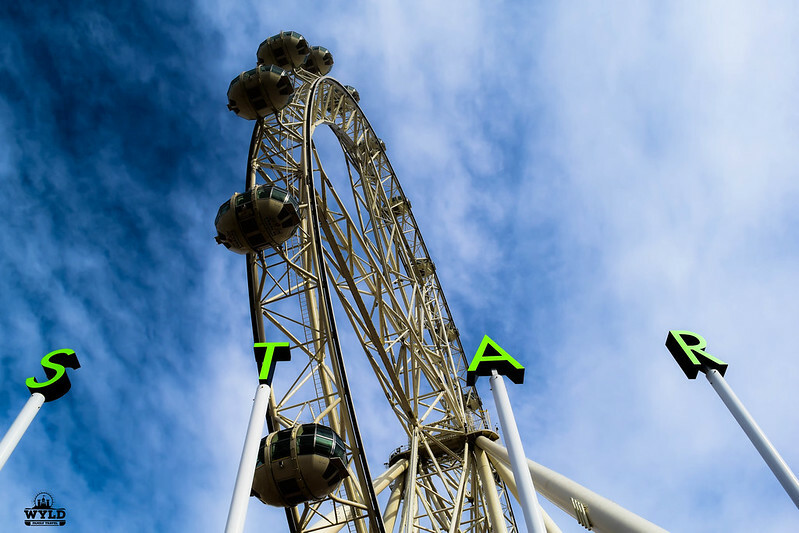 A trip on the Melbourne Star takes 30 minutes for a full journey around the wheel. The Melbourne Star is a located in the Docklands district of the city of Melbourne Australia. We visited The Melbourne Star on a very blustery Sunday. The kids had a mixed look of excitement and fear all rolled into one of their faces but once we were on the Star excitement took over! The staff on the boarding deck were extremely friendly and helpful with instructions and able to answer questions about your ride on the giant wheel. A nice touch is the P.A system that informs you of a monument, building or landmark to look for. The P.A gives you a rundown on the history of Melbourne. Information about the Star itself is featured during your journey. The Star is positioned so that you get a view of the bay area for the first half of the journey. The second half brings into view the Melbourne CBD. The Star is not cheap that’s for sure with a family ticket going for around $90 AUD. The smart move is to check Living Social and Scoupon for specials that often come up. 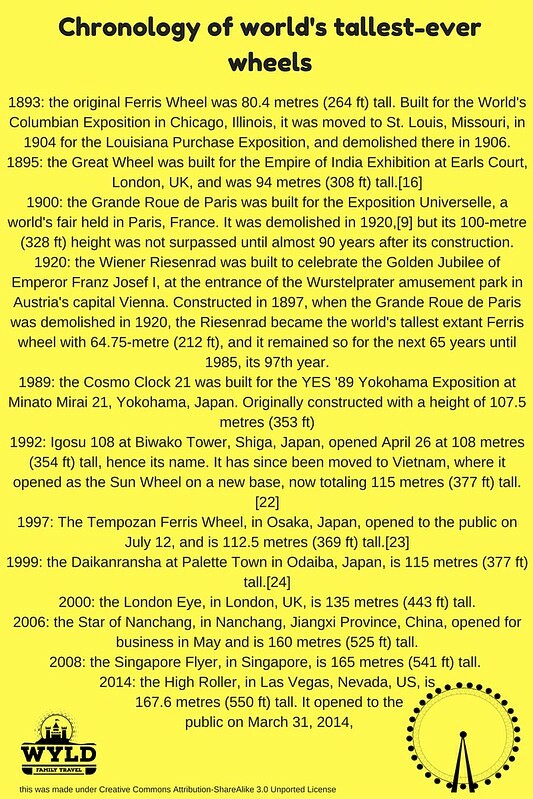 So there you go, what’re your thoughts Ferris Wheel or Giant Observation Wheel?. I think Ferris Wheel. I had no idea about the difference. I guess I’d never really thought about it, but the structure and purpose of an “observation wheel” IS pretty different from a standard ferris wheel! We have an observation wheel like this in Orlando, which debuted last year and stands about 400 feet tall. It’s about the same height as the one your family rode in Melbourne. I’m so glad you wrote this. We have an “observation wheel” here in Orlando, the Orlando Eye, modeled after London’s and everyone is always correcting me when I call it a ferris wheel lol. I had no idea the term observation wheel even existed! I like the infographic explaining the differences between the two of them. Now, I must add “observation wheel experience” to the bucket list. I like some of the taller wheels in the large cities but at this point far to many cites have wheels so it has lost a little of the unique aspect. I loved the London Eye though. They view is amazing for there. haha, didn’t realize that it made much of a difference but I will honor the proper terms. Hell, I get upset when someone calls the Street Cars in New Orleans a trolley car…ITS A DAMN STREET CAR!! So I like riding ferris/observation wheels but it was never a big bucket list item for me, however with that said, I will be riding The High Roller in February and The London Eye at the end of April next year! So I will share with you the fun! No matter what it is called, ferris wheel or observation wheel, I love it very much! It is so attractive, especially in the evening! I can not describe the ferris wheel or observation wheel in my own wheel! When I am on the giant wheel, everything is my eye! It is so amazing! Thanks for your replying, Mark Wyld! And I really love ths London Eye! I hope I can go there to ride on it one day!